Home / Families / World’s Best Dad? Congratulations, Great Job! World’s Best Dad? Congratulations, Great Job! I've never been a fan of world's best anything. Perhaps you too are a dad or in this case a metaphorical cup of coffee. Thinking to yourself, “Woah, I’m the world’s best dad, that’s my hat! How did that guy get it?” You might be right. But, I am not willing to relinquish my polyester crown just yet. While I may not wear the cap, I still claim dominion over it. I’ve never been a fan of world’s best anything. Don’t get me wrong; I love that my daughter, might even believe it. If she was a few years older, I am sure she would be giving it to me with a wink or sardonic irony. But, now, at ten years old she seems genuine. I have thought about altering the hat. Adding, “One of” before “Best Dad.” Or even, “Nya’s” before “Best Dad.” But neither seem to wax very poetically. I face a crossroads. 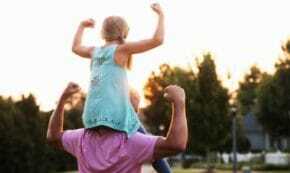 Between my self-consciousness and my daughter’s benevolence and self-esteem. I’ve never been good with exclusion. I once excommunicated myself, from a well-meaning, organized religion. I felt that some of the prayers left out too many people. I couldn’t understand how a religion could be anything but inclusive. So, for me to wear a chapeau stating, I am the best at something, knowing it might not be true, is difficult. It’s not like I had to pass a test or anything. I fear that my acceptance of such an honor would mandate that everyone in the world stop what they were doing. Not, just to acknowledge my greatness. But, also to shame those less worthy than me at their fatherly-duties. It seems the only logical course of action. I don’t make the rules. I am not comfortable initiating the backlash. But, I did not set this thing in motion. I am a victim as well. I search my memory for answers. I land back in 6th grade. I had purchased a sizeable “100% pure gold” necklace for my mother. It was in the shape of a #1 with the word Mom beneath it. Perhaps, the most exquisite piece of jewelry since the Hope Diamond! It would have made Mr. T proud! I remember the pride I felt in buying it. The excitement I felt in picking it out myself. The expectation of knowing that my mom would feel to wear it every day, proudly knowing that I had given it to her. After I gave it to her, I remember the type of kinds excuses she gave for not wearing it. “It didn’t quite match her current outfit.” It was “very special,” and it should stay safe in her jewelry box, perhaps. There were others as well, but, I suspect the real reason it remained out of her fashion rotation was its bulk. It’s true; if she moved swiftly, the momentum of the necklace might have put an eye out. Despite the reason, I pretty much knew, then and there, I was not a good gift giver. It has stuck with me to this day. Purchasing gifts is a paralyzing process for me. Armed with this knowledge, I did not want to burden my daughter to the same fate. So, I breathed an audible sigh of relief, when she came to me and said, “Daddy, it’s ok if you don’t wear the hat.” What? Where did that come from? Did she know how I would feel awkward wearing it? Had she changed her mind about its sentiment? Was I no longer not the most fabulous dad? Did she get a good look at my XXL head next to the cherub sized lid and realize my wearing it was a lost cause? Regardless, she had let me off the hook. But, then it occurred to me, she bought this for me. She put her heart into this gift. The kid who won’t share a centimeter square of a brownie thought of someone else. That, someone, was me! I again thought back to the necklace. How proud I felt when she did wear it, even if it did turn her neck green! In a flash, I knew what had to happen. I knew that wearing the hat was more important than my self-consciousness. It was more significant than the feelings of thousands of inferior dads. Dad’s that would have to face me in line at food courts and Boondocks Fun Centers around the world. It didn’t matter. I knew I had to wear the hat, in public and with pride. So, if you are a dad, and see me out and about, wearing my chapeau of glory; know that I am not self-aggrandizing. I am not rubbing my accomplishment in your face. I wear the hat for all of us! If Atlas can carry the weight of the world on his shoulders – Then my massive cranium can heft the burdening moniker “Best Dad Ever!” upon my noggin. But, if you see me in line behind you, at the Orange Julius, you really should let me cut. I obviously deserve first dibs on my super-sized Americanized Morir Soñando. After all, I’m the one wearing the hat. 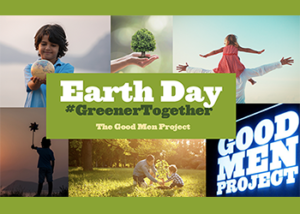 If you believe in the work we are doing here at The Good Men Project, please join like-minded individuals in The Good Men Project Premium Community. 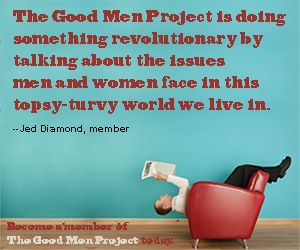 Get the best stories from The Good Men Project delivered straight to your inbox, here. Sign up for our Writing Prompts email to receive writing inspiration in your inbox twice per week. 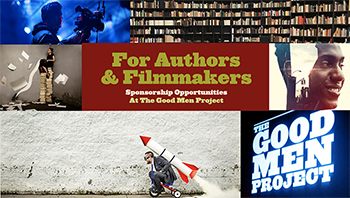 The Good Men Project is an Amazon.com affiliate. If you shop via THIS LINK, we will get a small commission and you will be supporting our Mission while still getting the quality products you would have purchased, anyway! Thank you for your continued support! 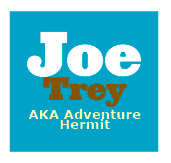 Joe Trey cut his teeth writing in the world of Adventure Motorcycle Travel. While he still enjoys it, he felt a calling to share on a deeper level. He writes and creates programs to support courageous men and women to turn their dreams into memories. 5 Strategies To Help You Deal With a Divorce Grief RelapseFeeling grief long after you’ve healed from your divorce is pretty common. 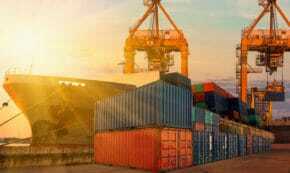 A Revolutionary Idea: Thinking Inside the BoxA simple idea for a better way of doing things changed global trade. 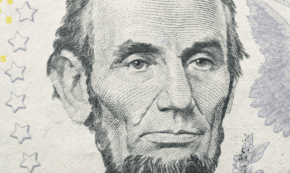 My Hobby Is Following Dead PresidentsWhere has your money been? “So If I Brought a One-Year-Old Home, Would You Be Ok With That?”If your significant other asked you this what would you say? Relationship Alive! 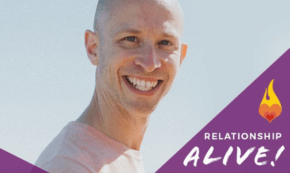 Don’t Be A Victim of Attachment TheoryHow do you avoid being victimized by your attachment style?